Invisalign are tools used by dentists to align teeth. The Invisalign design and size varies depending on factors such as the teeth sequence of a patient. Orthodontics prescribes Invisalign in order for them to gradually change the alignment of a patient’s teeth. The aligners are constructed using plastic. The plastic material used in making them is almost invisible such that it is hard to see them once they have been worn. They are easy to remove hence temporary. Braces are also used by dentists to align your teeth properly but at times their sight can be unappealing. Invisalign are an ideal way to align your teeth without having to put up with braces. There are several dental clinics dealing with Invisalign in Downtown Los Angeles. These teeth aligners fit perfectly on the teeth hence they need to be customized in order for them to effectively realign your teeth. The process of realigning occurs progressively to the desired alignment. As a result of them not being permanent it is possible for the patient to brush and floss them properly. The cost of getting Invisalign is dependent on the region you reside in. If you live in the heart of the city or at the beach fronts the lifestyle there is a bit expensive as compared to the other areas and so will the Invisalign. It is important to research and find the average price charged in your area for Invisalign in order to get the best deal. 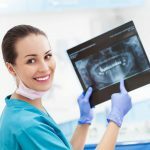 Keep in mind also that very low costs might also mean inexperience on the dentist’s part and use of sub-standard apparatus and techniques. The average charges incurred for Invisalign is usually easy on the pocket. This price can, however, fluctuate depending on how much your teeth are misaligned. The vice versa is also accurate. The amount also varies depending on the total teeth being fixed up. Are Invisalign included in your insurance cover? More often than not the insurance providers do not include dental procedures like Invisalign in the cover. It is only in special situations such as when the patient might need to undergo the procedure due to injury that they might consider paying for it. At the Smile LA Modern Dentistry, we can provide you with a feasible payment plan that suits you in order for you to get the Invisalign in downtown Los Angeles. Prior to making invisaligns for our clients at the Smile LA Modern Dentistry, we conduct several preliminary examinations to identify the most ideal model to employ in order to properly align your teeth. A test using mould taken from your dentition is used to make an illustration of how your dental alignment looks like. A 3D view of the alignment is created using a scanner to show the teeth that need to be realigned for the alignment to be perfect. After the teeth to be shifted are identified the 3D scan submitted to the lab for the invisaligns to be custom made. Accuracy is an important factor to be considered during the scanning and creation of the invisaligns.